This is something fun and silly that I came across on the web-- if you are into astrology or just crave some insight into your upcoming new year then check out The Personal Year. Honestly, my personal year outcome sounds a bit surprising, and even a bit stressful!! Christmas 2008 has come and now it has gone. It was really a great year for our family; we had the chance to all be together and really enjoyed each other's company. My little guy really had a blast this Christmas. He received a bunch of great gifts from Santa and even a special visit from the jolly old Elf himself. On Christmas eve Santa made a special appearance at our family get together. Well, my little guy sure knows a good thing when he sees it and he was right next to Santa the whole time ready to take all those extra gifts off his hands. I was so happy to see that he had no fear of the bearded one. It seems like a candy cane can always do the trick -- no wonder we have to tell children not to take candy from strangers. These past few days following Christmas have been lazy ones, but why shouldn't they be. I definitely need to relax after all the running around and planning involved for this holiday. Yesterday, the weather was so mild here that we were able to spend some time in the yard and I had a chance to try out some of the features on our new camera-- a gift from Santa! The temp. was in the low sixties, and you could almost start to believe that spring is right around the corner. Wouldn't that be nice! Let's face it, after Christmas winter is such a dreadful time of year. Well, I'll have my daydreams of warm afternoons and BBQ's to keep me going through January and February. Just a few last minute holiday creations that I wanted to share with you. First, a gift card holder I put together for one of the gifts we are giving to my parents. I used paper from Basic Gray's Figgy Pudding collecting-- which I absolutely love. The silouette of the little angel placing the star at the top of the feather christmas tree has a real vintage feel to it. It might look like a stamped image, but it's actually something I found in a holiday crafting edition of a BH & G's magazine. I scanned it, then selected it with the magic wand in photoshop, moved it to a clear layer and then printed it out onto a tan card stock. I inked the edges with Martha Stewart's Copper and Brownstone inks to give it an aged look. I really like how the card, and particularly the image turned out. 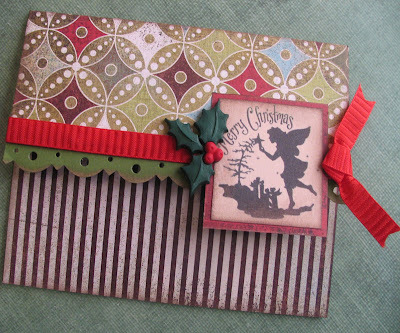 Altough I've come across a number of Christmas stamp sets that I wouldn't mind getting my hands on, I also love to take something and use it in a way that it wasn't acutally meant to be used. It really get's my creativity on! I also made two Christmas tree ornaments using the same image. I had a few sheets of Melissa France's vintage Christmas DP that I absolutely wanted to somehow incorporate into my holiday decor, so I thought that they would be the perfect fit for this image. Since I had the image on a clear PS layer I was able to resize it and print it directly onto the DP. I then used Modge Podge to adhere it to a piece of cardstock, which I cut out in the shape of a gift tag. I added a piece of sheet music to the bottom to add some interest and finished it off with some ribbon embelishments and some glitter and gem stones to give it that Christmas bling. Although these pictures came out awful, they really do look nice on the tree. I plan on making "improve my photography skills" one of my New Year's resolutions. Our backyard sometimes reminds us of a petting zoo-- not only do we have a myriad of different birds, but we have had gophers, skunks, possums and of course squirrels. This weekend my hubby thought he would do something creative and made a bird feeder out of a left over apple juice container. We couldn't wait to see all of our little birdies feasting from it. Well, OK-- all of our little squirrels feasting from it because I have yet to see a bird attempt to get near it-- I wonder why? Thanksgiving has come and gone. We spent a quiet holiday with some of my family. Not that Thanksgiving was ever a riotous day, but this year was especially subdued. I think we were all feeling a bit under the weather-- which is never a good way to spend a holiday. But all and all, it was great to sit down and break bread with family members that we don't get to see very often. To commemorate this Thanksgiving I thought I would make some special place holders. They were especially for my Aunt who hosts us every year at her house for Thanksgiving dinner. I don't bake pies, so instead I made place holders. A few weeks ago a friend of mine invited me to join her for a stamping class at the public library. 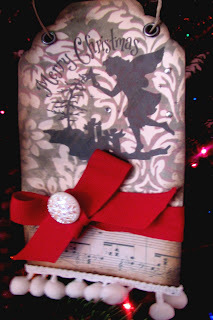 The class was hosted by a lovely woman who just happens to be a Stampin' Up demonstrator. It was great! Vicky showed us a bunch of card making techniques and how to use a bunch of tools. And the best part of the class was that we got to make two cards to take home with us! I can't wait to do it again. The first card we made was the purple and green-- great color combo-- pansy card. For that one we were shown how to add a thin layer of ink with a blending pen to give the stamped image a painted look. For the second card, we used tools like sponges to apply ink and a scalloped punch. The second card actually has a pocket on the inside for placing a gift card-- oh so fun!